Wednesday, August 27 • While we like to spend a whole day at the Minnesota State Fair, the largest 12-day event in North America, we can't this year so we go for dinner. A chili dog, a pot-roast sandwich, a Juanita's Fajita, and a corn dog, all shared and washed down with beer. We miss the dog building, the art building, the meatball sundae at the Epiphany Diner, the chocolate shakes at the Dairy Building, the quilts and sock monkeys and seed art and human heads carved in butter and so much more, but we ride the Sky Glider (the open one where you can dangle your feet), walk around Heritage Square, and hear a bit of War (but not, alas, "Low Rider") at the Leinie Lodge. The weather threatens all evening, with occasional sprinkles, so things start closing down early as we stroll the grounds. 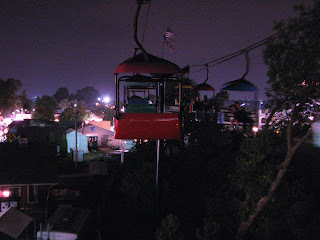 We buy roundtrips on the Sky Glider and by the time we get off (at the north end of the fair, on Machinery Hill), it's as if we have the whole place to ourselves. Strange yet wonderful and romantic. By the time we make our way through the sheep and poultry barn, down the Midway and out to our Park and Ride stop, then take the bus to the lot where our car is waiting, the weather is no longer threatening but dead serious. We run to the car, dive in, slam the doors, and all hell breaks loose--thunder, lightning, pouring rain. 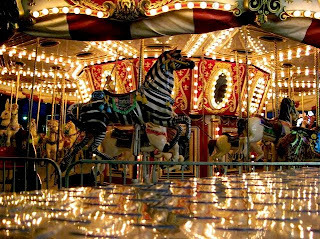 Not a typical visit to the Fair, but unless you get your pocket picked or make yourself sick on rides and fried food or get knocked down by a big runaway pig (which happens), there's no such thing as a bad visit to the Fair. P.S. Bebopified started with a post about the Fair, which means we're almost a year old. When: Monday, August 25, 2008 • Where: Dakota • Who: Pee Wee Ellis, musical director, band leader, saxophone; Fred Wesley, trombone; Cheikh Lo, voice, guitar, drums; Vieux Farka Toure, voice and guitar; Martha High, voice; Fred Ross, voice; Charles McNeil, alto sax; Reggie Ward, guitar. Not sure who the others were but these names are listed on the SBSP Web site as the US band: Eric Herman, bass; John Mader, drums; Peter Madsen, keys. Et al. Hunh! You’ve got the music bug bad when you work flight reservations around concerts. SBSP was originally scheduled for Sunday the 24th so that’s when I flew back from CT. Then it was rescheduled for Monday the 25th. Thank God it didn’t move backwards a day or I would be in deep despair. There are at least 10 people on stage at all times and the music never stops. 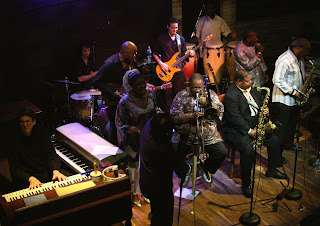 “Soul Pride,” “Hot Pants Blues.” Congas, drums, a B-3, guitars, saxes, trombone, bass. Martha High, last scene in these parts with Maceo Parker, sings “Try Me” and “The Big Payback” (“Payback! Revenge! I’m mad!”). Pee Wee says, “Martha used to ride with us on the bus with no AC—back in the day, back in the day.” The amazing Cheikh Lo sings “It’s a Man’s Man’s World” with screams and Senegalese lyrics. “Make My Funk the P. Funk” (“I want my funk uncut”). People in the audience get up and dance. Funk and grooves and African beats and American R&B, gospel and romance and revolution. Gorgeous greasy slip-slidey horns. Pee Wee’s proclamation: “We have a burning desire to please you.” The great “Still Black, Still Proud,” which doesn’t sound at all out of place in a room full of mostly white people because some things really have changed for the better, and suddenly I think maybe Obama can win this thing after all. Encore: A laid back and easy “I Feel Good.” I knew that I would. That’s why I came home. All photos but the last by John Whiting. Monday, August 25 • I'm sitting at my desk minding my own business, windows open, summer breezes blowing in, when I hear the unmistakable sounds of a marching band. We live a few blocks south of Southwest High School and every so often this small miracle happens in our neighborhood. What is it about marching bands that makes you want to run out of your house and dance down the street behind them? Keith Liuzzi directs all of the bands at Southwest. Mirabile dictu in a time when so many arts programs are getting the axe, SW has several bands and orchestras. Photo by John Whiting. Go on, click on it. 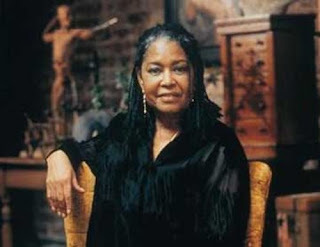 August is the birthday month of jazz vocalist, songwriter, and composer Abbey Lincoln. KFAI executive director and program host Janis Lane-Ewart featured music by Lincoln on all four of her "Collective Eye" radio programs this month. I was her guest on the August 28 show, which is available for streaming now through September 11. I didn't know much about Lincoln until recently; Janis says she is underplayed and underappreciated. During the past few weeks I've been listening to several CDs: Abbey Is Blue (1959), Straight Ahead (1961), The World Is Falling Down (1990), Devil's Got Your Tongue (1992), Who Used to Dance (1996), Abbey Sings Abbey (2007). I love her big voice and personal sense of timing, the unusual way she attacks words and phrases and the emotion with which she sings. 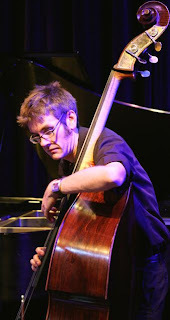 Jazz is full of discoveries to be made and catching up to do. Lincoln had heart surgery last year and her performance at this year's Montreal Jazz Festival (her long-awaited debut there) earned reverent reviews that also noted her thinness and frailness. She will be a special guest at the Iridium Jazz Club in NYC from October 31–November 2. I wish I could be there. Read and hear a profile of Abbey Lincoln at NPR. Her page at Verve, her record label. Photo from her photo gallery at Verve. I'm sorry to miss this late-night show because I've never heard Tanner play the B-3 except on the the trio's MySpace page. HH went and had a good time. The two newest tunes on MySpace ("Gibraltar," "Witch Hunt") were recorded there and then. 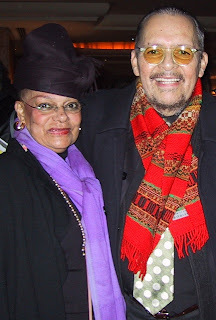 Thanks to my friend Janis Lane-Ewart, who arranged an introduction, I met and spent time with Dollie McLean, widow of jazz legend Jackie McLean, when I was in CT last week. I wasn't planning to write about her and the nonprofit Artists Collective she and Jackie co-founded but left our meeting wanting to tell an inspiring story and let people know about a worthy organization. Writing about someone without his or prior knowledge can be like bursting into a house, gun drawn, without shouting "Police!" I took a chance and hoped for the best. Dollie was surprised but in a good way. And I think the article turned out well. 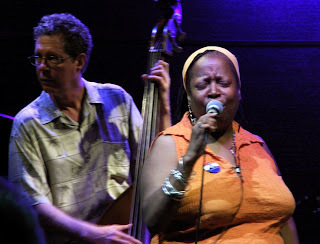 Photo of Dollie McLean and Jackie McLean from the 2004 IAJE conference in New York City. Jackie passed away in 2006. HH goes solo to a show he later describes as "really fun. He's a showman. He played serious stuff and goofy stuff. Good entertainment, not hokey. Big crowd." Also in the house: our own Connie Evingson, Charmin Michelle, Denny Malmberg, Maud Hixson, Rhonda Laurie, Christine Rosholt, Maryanne Sullivan, and Orchestra Hall's impresaria Lilly Schwartz. While I'm in CT at Soul Mountain Retreat, HH is taking in some jazz on his own. Like the Jazz is NOW! open rehearsal/party fundraiser, a preparation for the NOWnet's formal premiere on Tuesday, October 7, at the Minnesota Opera Center. Along with writing and reading, I'm spending some of my Soul Mountain time paging through fashion magazines. The September Vanity Fair is the Year’s Best Dressed issue. Marilyn had a massive Harper’s Bazaar she pulled out of the recycling for me. And this week’s New York Times Style magazine is the Women’s Fashion Fall 2008 issue. Jackpot. When did handbags become a fetish? Looking at Vanity Fair, I see the Armani Amethyst Bag, the tangerine-colored Dior clutch with the dangly D, the giant floppy Burberry bag with the eyelets along the seams, the wine-red Dolce & Gabbana, the ostrich Bottega Veneta, the Hermes “Jepsiere” bag in “taurillon Clemence” (whatever that is), the black YSL, the Michael Kors croco with the pocket on the front, the leopard-print Ralph Lauren “Ricky,” the Antonio Melani “Abby” bubble croco leather, the huuuuge Andrew Marc, the exquisite Miu Miu with teal accents, the blood-red-patent Givenchy, the understated Dooney & Burke, the Tod’s Pashmy bag in black nylon, the adorable yellow Versace…and we still haven’t passed the table of contents or mentioned a designer more than once. I love them all except the Bottega Veneta. Ostrich creeps me out. In New York last summer, I convinced HH to join me on a chase through Chinatown after a man who approached us, murmured “ambag? 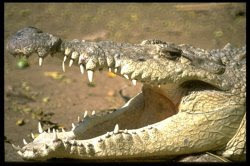 ambag?” then stayed five paces ahead, looking over his shoulder frequently to make sure we were still there. First we went up a dark, skinny staircase into a small, dingy apartment and a back room where bags lined the walls. All knockoff Pradas with their labels on crooked and logo Coaches…feh. “Louis?” I asked hopefully. “Follow,” he said, leading us back out of the room and through the apartment and down the stairs and into the street, turn here, turn there, walk walk walk turn turn and into a street-level shop of some kind. Beads, maybe. A wall slid open to reveal another room full of Pradas and Coaches. HH did not like our clandestine expedition, not at all. To get that Louis Vuitton Babylone Tote, I'll have to join Bag Borrow or Steal. I didn't used to care. I sold Coach bags at yard sales and mailed them to my former mother-in-law. Someone gave me a Fendi once and I must have given it away because I can’t find it anywhere (and I have looked). Years back I had a small Chanel clutch and matching wallet. Both gone. Where are they now? Not long ago I saw a Martha Stewart program on handbags. She says it’s worth spending big bucks on a designer bag. She says it's a good investment. $1500 for a Zac Posen bag is not too much, says Martha. I disagree. It is too much for a Zac Posen. Gucci has a new collection with a perfect name. It’s called Hysteria. Smallish bag in olive suede, $1495. Large tote, $1750. Medium top handle bag in purple python, $4190. Medium top handle bag in dark grape crocodile with gold hardware, $37,500. That has to be a typo. Is it a typo? It's not a typo. Of course I know that fakes are never in fashion. And I find the fear of getting caught a powerful deterrent to criminal behavior. Would I have bought a faux Louis had the opportunity presented itself? Oh, probably not. I'm off to Soul Mountain Retreat in CT, the writers' retreat and home of my dear friend and former CT Poet Laureate Marilyn Nelson, where I plan to do some writing. Or drink bourbon and shop. Or drink bourbon and write. And catch up with Marilyn, who has just returned from Africa. And listen to Abbey Lincoln. And miss HH. 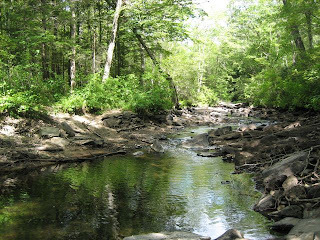 Photo: The Eight Mile River at Soul Mountain. I’m not much into indie/experimental pop/rock except where it intersects with jazz, but I saw Tim Glenn play recently with Kelly Rossum at the Dakota, Glenn is with Fog (along with Andrew Broder, who gave a memorable performance at the Cedar with George Cartwright), and I’ve seen good music at Maude. 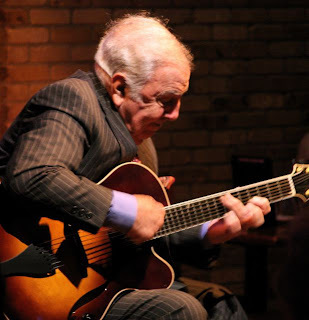 Plus (now former) City Pages writer Jeff Severns Guntzel wrote a glowing feature on Martin Dosh back in April that made me really, really want to see him. So we go, up for anything and hoping the grilled Brussels sprouts are back on the menu. Guntzel loves Dosh and Philip Bither at the Walker loves Dosh and Mike Lewis loves Dosh but a half-hour goes by, we’re sitting right in front of Dosh and Glenn eating crab cakes and corn chowder (no Brussels sprouts yet; probably in the fall) and I’m not feeling the love. Dosh is wearing headphones, looping and recording. Glenn is doing something with wires and knobs and a computer. They could be anywhere, we could be anywhere. 2) the people, or at least some of the people, pay attention at least some of the time. I’m not saying that performers have to smile and dance and tell stories and take requests, or that the audience must be rapt and silent except for bursts of applause, but there should be some connection. I could be watching Dosh and Glenn on television, or from outside Maude looking in through the big window, or through one-way glass in a police station. Maybe it's an off night for them, maybe it's just me…but the crowd is smaller than I've seen on a Saturday night at the normally hopping bistro. The usual complement of jazz musicians and moms isn't here. It could be packed with other indie musicians and I wouldn't know, but no one seems to be listening very hard. We stay for one set (actually one extended, repetitive piece), pay our bill, and leave. 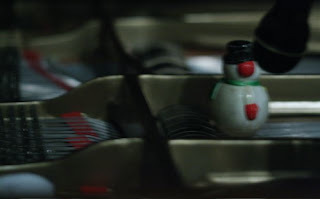 The photo is of the snowman inside Dosh’s prepared piano. Blurry and indistinct, like the evening. 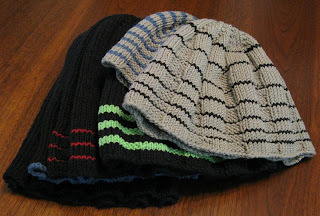 I've been making hats but not finishing them (i.e., tying in the annoying ends). Recently I took several to my LYS and did the dull deed in pleasant company. The bottom left, all-black hat goes to Leon Brown. Black with thin blue border: Vincent Gardner. Black with thin red stripes: Carlos Henriquez. 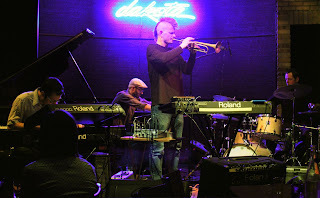 Brown, Gardner, and Henriquez were part of Irvin Mayfield's sextet when they played three nights at the Dakota in March. Black with wide green stripes: I'll hold onto that one and decide later who gets it. Gray with blue stripes: honorary cat HH. Gray with black stripes: Gordy Johnson. 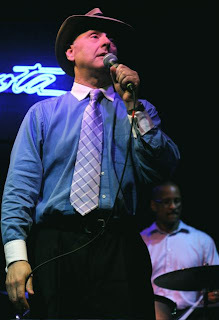 When we saw him at D'Amico Cucina in July, I asked if he would like a hat and he said yes. Not everyone wants a hat. Some people don't wear hats. Some think there's a catch--that they will owe me something. No catch, just karma. I’m already a fan of Kac (say “cats”) and Linz; I haven’t seen Hennig as often but he’s growing on me fast. So I’m eager to hear what they do. 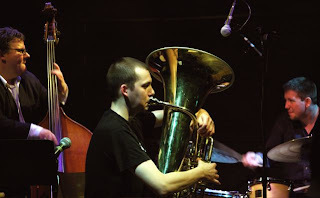 The tuba-led trio is such a rare configuration that it deserves attention. But what form does it usually take (if there is a “usually” about it)? I’ve read about tuba-piano-drums (Bill Stewart, Rod Williams, Billy Hart) but tonight’s tuba-bass-drums may be a first. In the early days of jazz, the tuba was the bass (replaced by the upright bass when sound recording technology improved). So Kac’s new band is essentially a trio of two basses and drums. But it’s a lot of low notes. 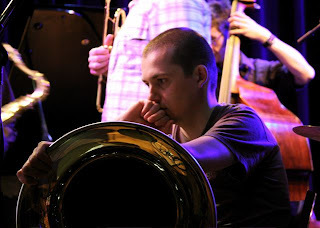 Even though Kac often plays on the high end of his instrument, what’s high for a tuba feels low to the senses. So I find myself craving a little brightness—a piano, maybe, or a saxophone. 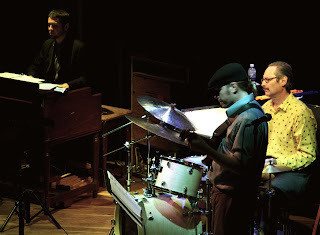 Some jazz tubists (Jim Shearer, Jim Self) have recorded with harmonica and guitar. So I’m not sure this trio is entirely successful. Which is not to say I’m sorry we’re here; I’m not, and when they play again I’ll probably go to hear them again. I like these musicians; I trust them to play well and take chances. • Kac is famously taciturn during live shows but garrulous as all get-out on his blog. Opinionated, too. • Want to know more about the tuba? This segment Christopher Lydon recorded for his Open Source podcast/blog is full of tuba facts, history, lore, and music. 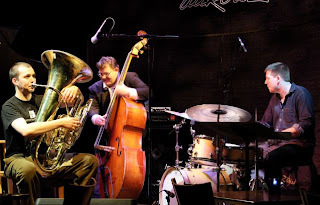 At one point, classical and jazz tubist (and pediatrician and author) Eli Newberger talks about when and why the upright bass replaced the tuba in jazz bands. • Photos by John Whiting. 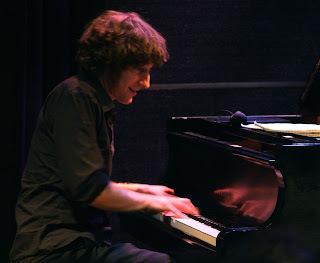 Seeing and hearing Arne Fogel perform is always a pleasure. Tonight’s house is small—it’s one of the too-few lovely summer evenings we enjoy in Minnesota and a lot of people are outdoors—but he sings like it’s SRO. He’s a pro. The trio is as tight and right as you’ll ever find. 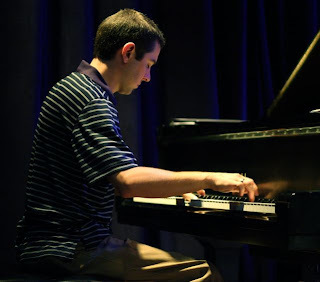 Tanner’s swinging piano leads the way with big fat chords, glittery runs and sly syncopations. Arne is full-throated and fine. Debbie Duncan is in the house; Arne invites her up to sing. She takes a moment to say how much she enjoys singers who give you background on their songs. Then she sings a tender, breathy, slow and wide-open version of “But Beautiful.” Gorgeous. Satisfying set list. Warm and generous performances from all. Hear Nancy Harms sing at her MySpace page. 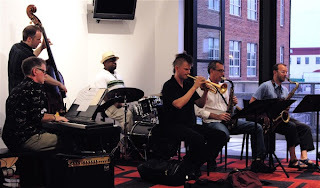 See and hear Arne Fogel with Tanner Taylor at Baby Blue Arts. 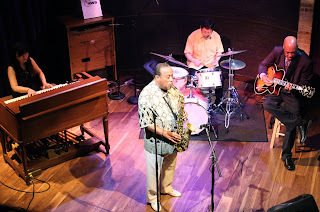 The last time we saw Lou, in August 2004, he brought the same drummer (Tainaka) but a different guitarist (Randy Johnston) and B-3 player (Dr. Lonnie Smith). 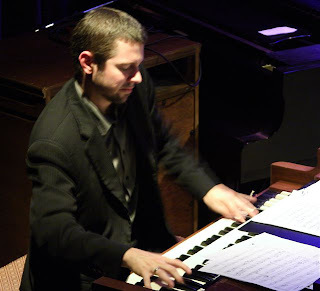 Tsuruga is Smith's protege and Johnson has played with Donaldson in other organ combos. 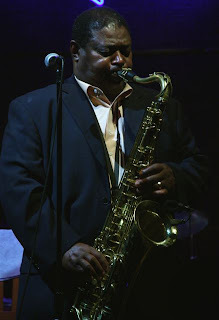 A bebop and hard bop legend, Donaldson is still blowing strong. 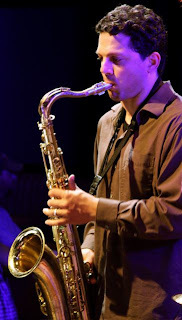 His facial expressions are nearly as interesting to watch as his saxophone is to hear. He mugs. And he talks to the crowd in between songs, something I generally like unless I hear the same patter two nights in a row. That did happen in '04 so we're coming to just one set this time around. "Things Aren't What They Used to Be." A hilarious version of "I'd Rather Drink Muddy Water" ("I'd rather smoke crack...eat chitlins without hot sauce"), and a story about buying his woman a wig from Woolworth. Then he's gone, having told us a bit earlier that "it's inspiring to get a nice reception, but we cannot forget I am approaching 82 years old and an intermission is needed." He turns 82 in November. We're seeing a lot of elderly jazz artists lately. Long may they roam. Group photo by John Whiting. Fifty years ago today, photographer Art Kane (1925-1995) created one of the most famous photographs in jazz. Fifty-eight jazz artists (55 men, 3 women) crowded onto the staircase of a brownstone in Harlem at 10:00 in the morning. There would have been fifty-nine but Willie "The Lion" Smith got tired of standing (and left a hole in the second row). A copy of Kane's Harlem 1958 hangs on a wall at the Artists' Quarter in St. Paul. 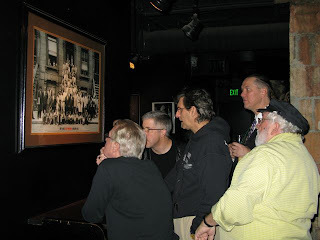 In January of this year, I snapped a photo of AQ owner Kenny Horst, doorman extraordinaire Davis Wilson, HH, pianist Jon Weber, and an unidentified fan standing before it, trying to identify the seven artists still alive today. The Art Kane Web site has a special page where you can zoom in and see the names of every artist in the photograph. Sonny Rollins was just 27 on that day. He is one of the survivors. 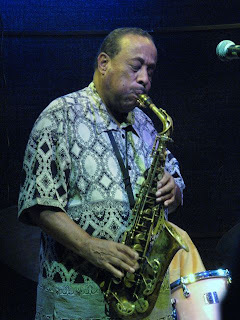 Saxophonist Johnny Griffin died on July 25, so now there are six: Benny Golson, Hank Jones, Eddie Locke, Marian McPartland, Rollins, and Horace Silver. See Alan Kurt's article "Jazz's Most Iconic Photo Is Half a Century Old" in jazz.com. 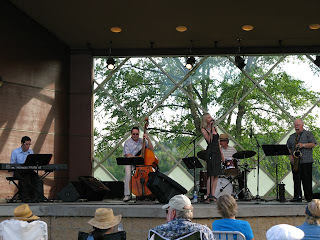 When I previewed this festival for MinnPost, I hoped to attend more than just Connie's set but that's all we could do. It turned out to be a perfect start to the evening: beautiful location, lovely weather, and a fine set from the singer and her band. "Nature Boy," "some Peggy Lee songs ("I Don't Know Enough About You," "Gone Fishin'"), Toots Thieleman's "Bluesette," an arrangement Connie did with Dave Karr blending "I Love Paris in the Springtime" with "It's All Right with Me," selections from her recent CD with Dave Frishberg including "Peel Me a Grape" and "My Attorney Bernie," tunes from her Swedish Hot Club CD, "Comes Love" with Karr on clarinet. Kids were running around and dancing in front of the stage. Some people in the audience were attentive, some not so much. It was Carmen's first jazz festival and she seemed to like it. 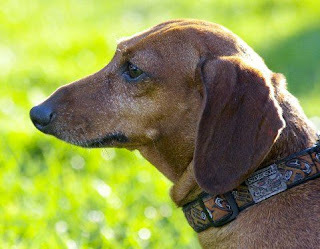 Photo of Carmen the wiener dog by Andrea Canter. When: Thursday, August 7, 2008 • Where: Rogue Buddha Gallery • Who: First set: J.T. 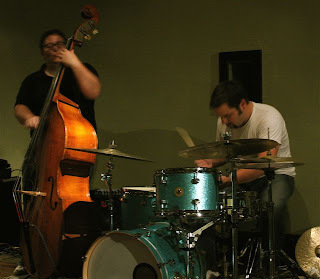 Bates, drums; Adam Linz, bass; Paul Metzger, banjo. Second set: Volcano Insurance: Luke Polipnick, guitar; Joey Van Phillips, drums; Chris Bates, bass. I’m trying to remember the first time I heard and really listened, or tried to listen, to free jazz (a.k.a. avant-garde, outside, vanguard, experimental, unstructured…or none of the above). It might have been in February 2000, when the Cecil Taylor Quartet came here as part of the Northrop Jazz Season. That concert was memorable for two reasons: the music, which was crazy, and the speed with which much of the audience exited during intermission, never to return. But I liked it. At the Montreal Jazz Festival in 2001, we sought it out and found pianist Lee Pui Ming performing with saxophonist and vocalist Joane Hétu and clarinetist Lori Freedman. I wasn’t packing Moleskines back then so I don’t have notes. I remember hair flying, someone wearing a kilt, silences, maybe shrieking. The specifics of the music escape me. The emotional memory remains: I was happy. Perplexed, challenged, out of my depth, and happy. 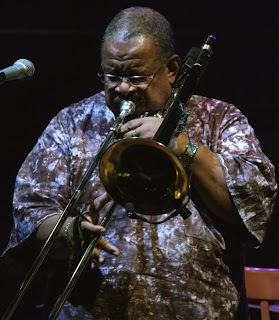 Because I like being happy, I go to see and hear musicians and groups like George Cartwright and Happy Apple and Anthony Cox and Fat Kid Wednesdays and Douglas Ewart. When Chris Bates sends out an email saying “This will be interesting, trust me,” I do. They all live here, thank goodness. 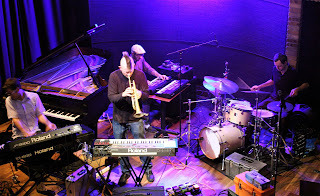 I also keep watch for people like Craig Taborn and Tim Berne, who come through here occasionally but not often enough for me. Hank Roberts, hurry back. And the annual Minnesota Sur Seine music festival is a mother lode of squeaks, squawks, wails, caresses, indistinguishable melodies, indeterminate rhythms, and sheer transporting joy. Chris sent out an email earlier this week, which brought us to the Rogue Buddha shortly before 9 p.m. last night. He and Adam Linz were standing outside talking and let us interrupt them. Inside, the crowd was small, maybe 18 people to start and five were with the bands and many of the others were musicians; we saw Scott Fultz, Pete Hennig, Park Evans, Joe-who-plays-guitar-and-things, and others I recognized but can’t name. Former City Pages and Strib music writer Jim Meyer had driven up from Farmington, where he now lives. For a while, I was the only girl in the room. 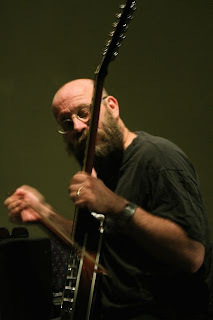 During the first set, my focus was often on Paul Metzger, who played a modified banjo: seven (?) extra strings, electronics, and who knows what else. For much of the time, he bowed it. Sometimes he used a plectrum or strummed with his fingers, and sometimes he played it like a tabla. I had never heard a banjo make such sounds before. I thought the banjo was boring except when played by Béla Fleck (and mostly I like him with Edgar Meyer). I don’t think it’s boring anymore. The J.T. Bates/Linz/Metzger combination played one long piece with slow parts and fast parts, solos and duos and trios, crescendos and decrescendos. The music came in waves. No melody, no regular rhythm, just flow. Banjo, drums, bass, banjo-drums, bass-drums, banjo-drums-bass. I thought of riding rapids, hanging on and hoping you’ll make it safely to the end and getting bounced around on the way. HH said it was like tasting wasabi for the first time. Linz plucked and bowed and patted his bass. J.T. 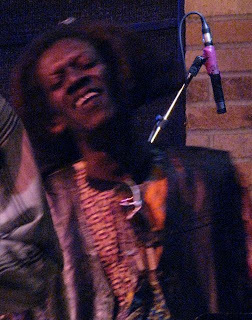 fell into his drums and brought forth rhythms wild and strange. At the end, I asked, “Did that have a name?” J.T. said “No.” Of course it didn’t and I knew it didn’t but I wondered if he would make one up. After a break and more $2 wine: Volcano Insurance. Their music was more mellow than I expected from the name. Polipnick’s guitar was dreamy and delicious. I thought I had seen him before and made a mental note to look him up when I returned home. Yes: in April at the Clown Lounge with Tatsuya Nakatani and Chris Bates. Their final two pieces were fiercer, more fiery. For one, which Polipnick introduced as “a new ditty called ‘Calisthenics,’” they actually had a chart. They sometimes play from a setlist, so they’re not entirely about improvisation. What did they play? I can’t tell you. But I was there for the energy, the creativity, the inventiveness, the fun…the ride, the wasabi, the surprise. Whenever I try to write about free jazz, I wonder why I bother. It’s hard enough to write about music that has a form and structure. Or to write about a singer who uses words I can understand. This improvised, in-the-moment stuff, with altered banjos and pedals on the floor and wires and instruments that don’t even sound like themselves—who even cares if anybody writes about it? It will never be heard again. It won’t be replicated, and it can’t be bought and played on your stereo or iPod. It’s not only far out, it’s gone. But I realized last night, while scribbling notes in an effort to capture a fleeting sonic moment, that one reason I write is to entice. Maybe someone who reads this will wander into the Rogue Buddha for live music sometime, or check out the Clown Lounge on a Monday night, or set aside time for an Improvised Music at Homewood Studios event. When that happens, I’ll be even happier. Photos by John Whiting. 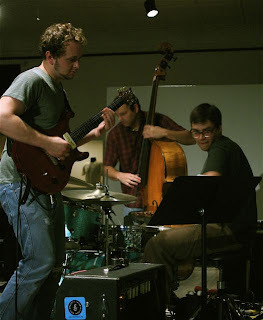 Top to bottom: Paul Metzger; Adam Linz and J.T. Bates; Volcano Insurance (Polipnick, Chris Bates, Joey Van Phillips). Kudos to Dakota owner Lowell Pickett for conceiving these shows. 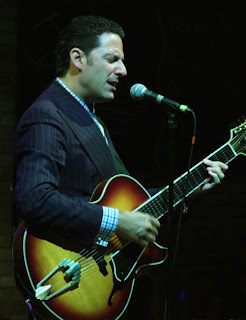 Green has a good reason to come to town (he’s seeing someone locally) and Pizzarelli was probably scheduled somewhere nearby but it was Pickett who paired them and how brilliant that turned out to be. Monday’s sound check was the first time they played together. We know that because someone told us; it doesn’t show when the music begins. 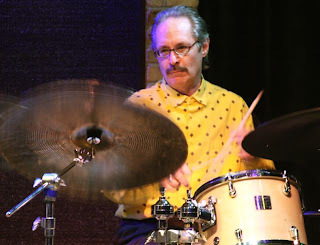 There’s an essential sweetness in the air, similar to when Kenny Werner and Toots Thielemans perform together, although those two have being doing it for years. Younger man (Kenny is in his 50s, Benny in his 40s); elder jazz statesman (Toots is 86, Bucky 82); lives devoted to music; heads full of song. “If I Had You,” “Easy to Remember.” Laid back, gentle and pleasing. Intimate from the start. Benny jokes that when Lowell called to see if he’d be willing to play with Bucky, he said “Yes…how much will it cost me? I’m here on the installment plan.” “The More I See You.” The new Dakota neon sign, now dimmed, thank goodness, casts a lovely glow. Wit, humor, virtuosity, ease. “Body and Soul.” A medley of Duke Ellington tunes: “Do Nothing Til You Hear from Me,” “In a Sentimental Mood,” “In a Mellow Tone,” “Satin Doll.” Simpatico, respect, connection. Every note clearly articulated. 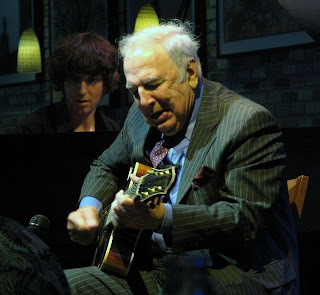 Tuesday’s set has a similar mood but different music: “Robin’s Nest,” “Tangerine.” Benny introduces Bucky as “every self-respecting guitar player’s godfather.” Tonight the Dakota is full, as it should be (as it should have been yesterday); this audience, like yesterday’s, is here to listen. Bucky and Benny will return in late September, this time to record a live CD. Can’t wait. Second (Benny) and third (Bucky) photos by John Whiting. I mean, look at this place. Jazz squashed in a corner, backed by cases of Coors and Leinenkugel and root beer. Who would play there? Who would go? 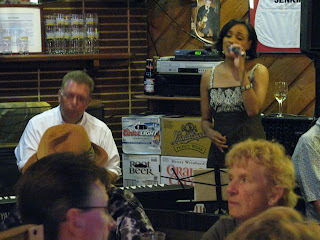 But this is Fireside Pizza, one of the quirkiest and most beloved little jazz venues in the Twin Cities. 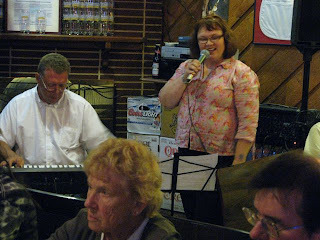 The Richfield pizza parlor has featured live jazz for who knows how many years—at least a dozen. Tonight MPR's Maryann Sullivan is in the house with her music. When Charmin takes a break, she sings some Peggy Lee. She sounds good. Come back soon, Maryann. Read more about Fireside at MinnPost. If you're in the area, go there some Monday or Wednesday. Have a house special with a side of meatballs. 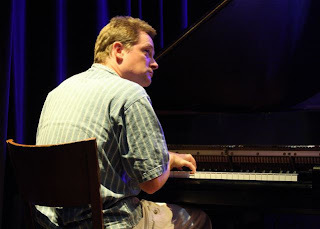 Warming up for his next European tour, pianist extraordinaire Bill Carrothers is playing three gigs in the Cities this week: at the AQ on Wednesday, at the Dakota on Thursday (a solo show), and again at the Dakota on Friday as part of the late-night series. I’d see all three if I could but we can only make the late-night show. The music is amazing. Playful, creative, tuneful. 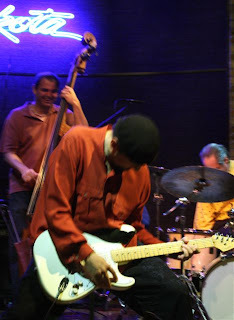 Blues, standards, Monk’s “Let’s Cool One.” Improvisations during which Epstein plays the edges of his cymbals with knitting needles, or something close to knitting needles. Magraw and Carrothers negotiate with each other about what to play, and no matter what they decide, Bates anchors it and holds it steady. As the evening progresses—this is after all the late-night show, this is Minneapolis—the audience becomes smaller and more devout. An exquisite solo from Carrothers ends it all. That guy. When I talk with Kelly the week before this late-night show (for a MinnPost preview), he's not yet sure what it will be. "The trumpet won't sound like a trumpet, and the piano won't sound like a piano," he says. And the music will be...? "Not outside, just over there." He explains that "circuit-bending is a technique where you physically alter an instrument. For example, you might take an old Casio keyboard, pop the top and rewire the circuitry." 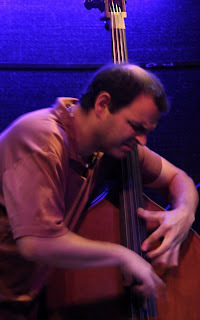 Craig Taborn does this, too, but until now I had no clue what it meant. Turns out the Rossum Electric Company isn't a new band but a revival. "Back in 1998," he says, "I played a gig with a band called the Rossum Electric Company at the Clown Night, subbing one night when JT [Bates] was out of town." He also plays his "electrumpet" for Electropolis. Tonight's first set is an hour long, without interruption. I strap in and hold on. The second set is shorter and also satisfying. As with any set involving a lot of electronics, there's a lot of pedal-pushing and dial-turning and button-adjusting, with wires snaking everywhere onstage. I can't always tell which sounds are coming from which instrument but I don't much care. The sound is good, the vibe is good, we're all having a good time. A quote from "Caravan" floats by, and other bits and pieces of tunes I think I recognize but can't name. Something reminds me of Miles Davis's "Tutu." Not outside, just over there. Photos by John Whiting. Aieeeee, the neon sign! A dimmer, we're told, is imminent. When a new band (like Ingo Bethke) starts up, it doesn’t consist of people who moved here yesterday. All are in other bands, other configurations, playing various types of music around town. 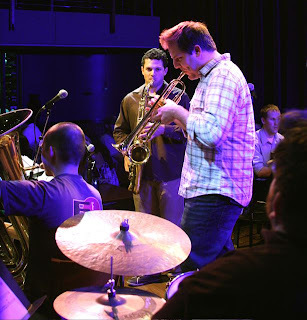 Kelly Rossum thinks this is part of what makes the Twin Cities a thriving jazz community—the opportunity to play all kinds of music with many different musicians and some of the same musicians as they move from band to band. I'd add to that the opportunity to listen. 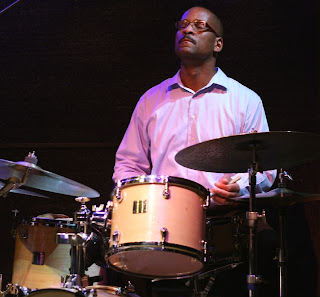 For example, hearing Bryan Nichols play with Connie Evingson is not the same as hearing him play with Michael Lewis. 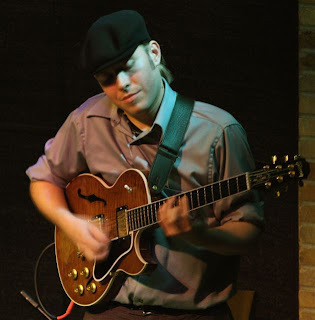 Everyone in Ingo Bethke plays or has played in other bands around town. (They all played together formerly in a band called The Journey.) I’ve seen Shilad Sen with Snowblind and Stefan Kac in a surprising number of places, considering he plays the tuba, not an instrument many people associate with jazz. We hear an extended composition by Kac—“Lights of Loveland,” I think it was, for which he recently won an International Tuba Euphonium Association award. Something by Buster Williams. Something that sounds like the soundtrack to a Fellini movie with carnivals and masks. Gilbertson's "Chaos Theory." Another Kac opus, "Caitlin's Tune." An Ornette Coleman tune. Solid straight-ahead stuff, too. Sometimes the tuba is so low you can barely hear it, like distant thunder. About the name Ingo Bethke: One of the band members (probably Zielinski) tells the story of how Bethke was a German who busted his brother out of East Germany in 1988. Is it true? There are stories about Ingo and Holger Bethke on the Web but they’re in German. Zielinski has a thing about the Cold War; read his MySpace bio to learn more about that. I like the sound of this group. It’s an interesting blend of instruments; a tuba always adds dimension and something else I haven’t yet figured out how to define/describe. It’s like a foundation for the rest of the music, but a foundation with open spaces. The notes linger and sigh and unfurl. The music is inventive but not too out there. More or less what I expected after I saw Ingo Bethke on the schedule for a free concert in a Minneapolis city park earlier this summer. When people are walking and biking in you can’t feed them a big helping of avant-garde jazz.